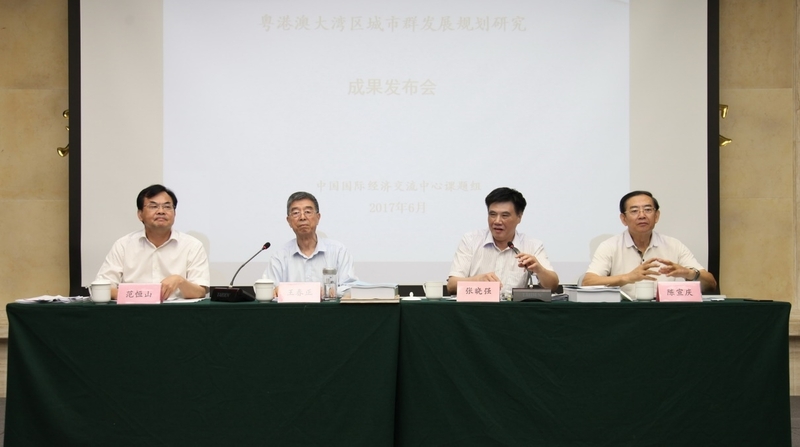 On June 22, 2017, CCIEE held the 96th Monthly Economic Talk, under the theme of Research Findings Release of City Cluster Planning and Development in the Guangdong-Hong Kong-Macau Greater Bay Area. Wang Chunzheng, Director of the CCIEE Experts Consulting Committee, presided over the meeting. Zhang Xiaoqiang, Executive Vice-Chairman of CCIEE, Fan Hengshan, Deputy Secretary-General of NDRC(National Development and Reform Commission), and Chen Xuanqing, former Inspector of the Regional Department at NDRC, delivered their speeches respectively. Zhang Xiaoqiang introduced the research of the world-class city cluster in the Guangdong-Hong Kong-Macau Greater Bay Area (Greater Bay Area), including the legal basis, the favorite condition, goal, specific content and meaning of the city cluster in the Greater Bay Area. Meanwhile, he pointed out the challenges facing this project, such as innovation, regional traffic and ecological pressure. In the future, the construction of the Greater Bay Area will follow the spatial arrangement of “one ring and two fans, two screens and six axes”. The realization of the goal of the city cluster in the Greater Bay Area needs further reform and opening up, sound system and joint effort of the mainland China, Taiwan province, Hong Kong and Macau special administrative regions. Fan Hengshan believes that the research well clarifies the significant meaning of the construction of the Greater Bay Area. He suggested that the planning process of the bay area should reflect the principles of problem and goal-oriented, priority should be given to the construction of hard and soft infrastructure, while taking regional differences and comparative advantages into consideration. Furthermore, the responsible departments should promote effective accumulation and integration of resources for innovation, understand the structure of city cluster to push forward innovation and development of cities. Lastly, they should give the role of functional platforms into full play and bring in global economic competition and cooperation. Chen Xuanqing introduced the basic thoughts of the research. He expressed that the research is themed with cooperative development, follows the mainline of innovative development, focuses on resolving big cross-regional problems and draws experience from successful projects of world’s leading bay areas and city cluster. The construction of the bay area should be realistic, forward-looking, inclusive and consistent. Moreover, he explained specific safeguarding measures and the spatial arrangement of the city cluster in the Greater Bay Area. In the Q&A section, experts answered various questions from the media and audience. Researchers from CCIEE, representatives from enterprises, research institutions and news agencies took part in the event.